That is what life has taught me. 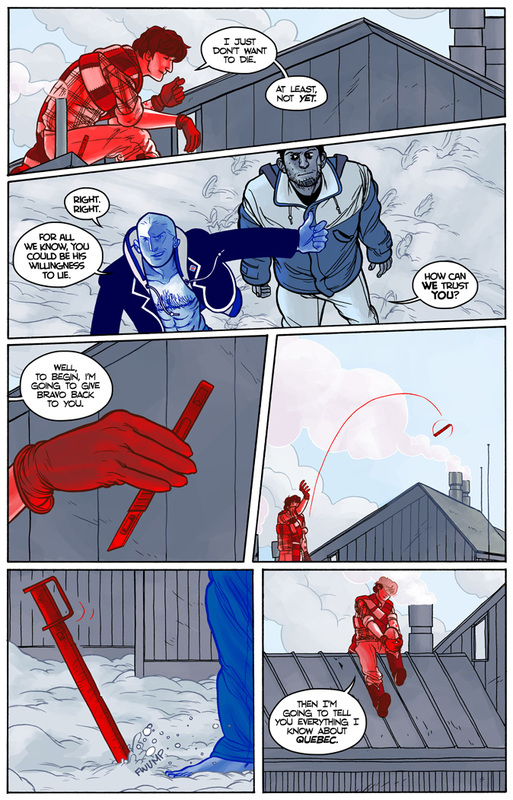 I like that Bravo’s a scalpel in Victor’s hand. Just another one of those nice, mysterious touches I’ve come to expect from AF. God, this comic really is amazing. The colouring and the line art…gah. So beautiful. There’s a lot of smoke up on that roof, and I’m sure it means something, because it obscures Victor. And who’s creating that smoke, anyhow? It’s interesting to see that Bravo can change form — but, then again, self-preservation in real-life can take many different forms as well.